This Beautiful hybrid lilac grows to only about 3-5 ft high but about 8-12 ft wide. 'Joyce Coulter' has dark green foliage and medium blue flowers which bloom all the way from March to May. This variety will tolerate pruning and a wide range of garden conditions. It is fast-growing and is a beautiful choice for large slopes, or above a retaining wall, or anywhere you want a low-water yet lush flowering plant. Due to the width of this plant you can cover large areas with just a few plants. It grows well in hot areas and is drought tolerant. 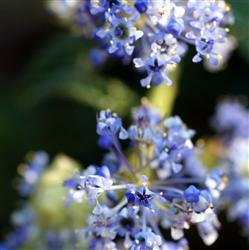 It is a natural hybrid of Ceanothus papillosus var. roweanus x Ceanothus impressus (possibly) and was introduced by the Saratoga Horticultural Foundation in 1956.